What are these liturgical honors and privileges? For groups and regions that can have a particular calendar it is just the liturgical memororial. Rules on this are in the Instruction of the Sacred Congregation for Divine Worship Calendaria particularia (in Latin; AAS 62 , 651-663). As a group like Politicans has no own particular calendar (and most time no own litrugical celebrations), I have no idea what kind of litrugical honors a Patron can be granted. Clarification: After Ken's Answer I want to further explain my question. The pope uses the term "liturgical honours and privileges which, according to law, belong to the Patrons of categories of people" like it is a clearly defined set of honours and privileges that apply to all "Patrons of categories of people". I want to know, if such a set exists and which privileges it includes. So a list of liturgical honors for certain Saints does not help me, even if they are also "Patrons of categories of people". Maybe the Red, Blue, ... Masses are such a privilege, but than I did not understand it. I have never heared before of this pracitice (Germany). If the Saint is mentioned in these masses, it may be one of the liturgical privileges I am searching for. What are liturgical honours and privileges for patron saints? The liturgical honours of each particular saint is that they each have a fixed day in which they may be particularly honoured at Mass or with a Mass in their honour in their feast days. Some saints have the special privilege of having a special blessing for something attached to them in the Rituale Roamanum, but not many. For example on the Feast of St. John the Evangelist there is a Blessing for Wine. This particular blessing is reserved and can only be used on St. John's Day (December 27). Not every saint has special liturgical honours! A patron saint of a particular group or locality may have his or her name mentioned at Mass in the (Eucharistic Prayer III) on the feast day of that particular saint or at the occasion when one employs a Votive Mass of their patron saint. Please remember that we are dealing with honours and privileges that touch the liturgy. Churches that are under the patronage of a particular saint have the liturgical privilege of celebrating his feast day as a solemnity, even if it falls on a Sunday. Principle Patronal saints of countries enjoy this same privilege. (St. joseph's Day (March 19) in Canada for example). Principle Patron Saints of a particular diocese enjoy also this same privilege within it's jurisdiction. St. Maurus’ Blessing of the Sick (January 15). The ancient formula may be found here on page 452. Blessing of farm animals on the feast of St. Anthony (January 17). Vatican City still honours St. Anthony with the blessing of animals on his feast day. There is a reserved blessing for throats on Feast of St. Blaise (February 3). The custom of blessing candles and/or throats on this saint’s feast day comes from the story of St. Blaise healing a young boy who had a fishbone stuck in his throat. The blessing of candles commemorates the actions of this young boy's mother, who used to bring St. Blaise candles while he was in prison. There is a Blessing of a bonfire reserved for the Vigil of St. John the Baptist (June 23). Since the Vigil of St. John the Baptist was not an obligatory fast day, many places, especially in Europe, celebrated the feast of St. John the Baptist with huge bonfires, which could be lit anytime after the first vespers of the feast (on June 23). The vigil often coincides in proximity with the summer solstice and the Midsummer celebrations, thus making St. John's Eve one of the most celebrated nights in all of Europe. Big bonfires are lit in Hungary, Croatia, Italy, France, Canada (especially in Québec), and in Spain, just to mention a few. 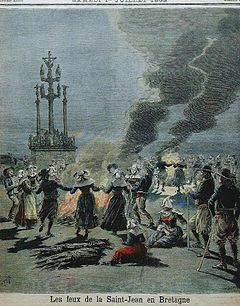 St. John's bonfires are hugely popular in Spain. The Benedicti Roji of the older formula can be found here on page 316. Blessing of Herbs is a prayer reserved for the Assumption of the Blessed Virgin Mary August 15). Blessing of Seeds is a reserved prayer for the Nativity of the Blessed Virgin Mary (September 8). Some dioceses have the privilege of certain blessings for particular saints of their region. The Blessing of Water, Salt and Bread in honour of St. Hubert is to be found in the Rituale Romanum (page 466) of Pope St. Pius V and is reserved to the Archdiocese of Cologne for St. Hubert' Day (November 3). At one time, the Dominicans had the privilege of blessing water with a relic of St. Peter the Martyr on his feast day (April 6). The blessing can be found here on page 453. The ancient formula of blessing wine in honour of St. John the Evangelist (December27) may be viewed here (Rituale Romanum of Pope Pius V) on page 312. As for St. Thomas More the following may be of interest. St. Thomas More has the privilege of being the patron saint of all statement, politicians, lawyers and people in public life. Not many saints are personally proclaimed patron saints by the pope in a Motu Proprio. The vast majority are not. St Thomas is thus in the category of special few. Deo Gratias. There is nothing stopping the Catholic faithful from saying a novena in honour of St. Thomas More or Catholic lawyers and judges from asking a priestly blessing on St. Thomas More Day (especially if a priest is in possession of a relic of St. Thomas). St. Thomas Moore was an English lawyer, humanist, scholar, father of four children, and martyr. He was also Lord Chancellor from December 31, 1525 to November 3, 1532. He was beheaded on July 6, 1535, for refusing to take the Oath of Succession. He is jointly commemorated on June 22 with St. John Fisher. He is the patron saint of statesmen and politicians and thus of lawyer also. Churches that are under the patronage of St. Thomas More have the liturgical privilege of celebrating his feast day as a solemnity, even if it falls on a Sunday. The Red Mass may be celebrated on the feast of St. Thomas More who the patron saint of lawyers. The votive Red Mass has no fixed day in which it may be celebrated, although most countries place it around the commencement of their judicial year. The Red Mass is simply a votive Mass in honour of the Holy Spirit for the intention of asking guidance from the Holy Spirit for all those involved in the justice system (judges, lawyers, advocates, doctors of law, law school professors, students and government officials). The phrase the Red Mass is two fold. Firstly, the liturgical colour of any Mass in Honour of the Holy Spirit is red and secondly the colour of the robe for judges of the High Courts (in many Countries) is also red. Doctors of the law also wore red robes. The Red Mass has a rich history. Beginning in England during the Middle Ages and continuing even through World War II, the entire bench and bar attended the Mass at the opening of the Court’s term. Liturgically, the Red Mass is celebrated as the Solemn Mass of the Holy Spirit. Its name derives from the traditional red color of the vestments worn by clergy during the Mass, representing the tongues of fire symbolizing the presence of the Holy Spirit. The Judges of the High Court, who were all doctors of the law, also wore red robes or academic hoods. With so many participants in red, the celebrations became irrevocably known as the Red Mass. The Red Mass historically marked the official opening of the judicial year of the Sacred Roman Rota, the Tribunal of the Holy See. One of the better-known Red Masses in the USA is celebrated at the Cathedral of St. Matthew the Apostle in Washington D.C. Since the Supreme Court convenes on the first Monday of October, the Red Mass is celebrated on the Sunday before the first Monday of October. It is normally presided over by a cardinal. In Ireland, the Red Mass is celebrated on the first Monday of October, which is the opening day of the Michaelmas Law Term. A Man for All Seasons is great classic movie (1966) entertainment for the entire family today! Not the answer you're looking for? Browse other questions tagged catholicism saint liturgy intercession-of-saints or ask your own question.